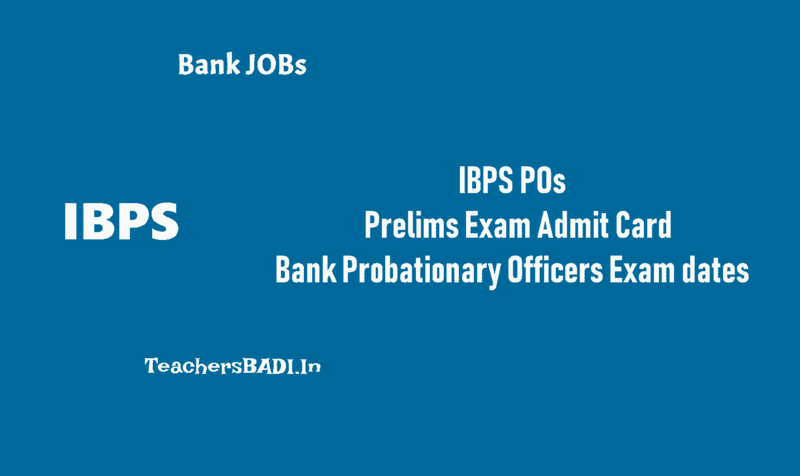 IBPS POs Prelims Admit Card 2018, Bank Probationary Officers Exam dates /IBPS POs Prelims Admit Card 2018, Preliminary exam start from October 13 (Probationary Officers): The Institute of Banking Personnel Selection, IBPS has released the POs Probationary Officers Preliminary Exam admit card on its official website - ibps.in. Here is a direct link provided to download the Probationary Officers Preliminary Exam admit card. The candidates who have applied for the examination can visit the official website of the IBPS or click on the link provided above to login and download their admit card for IBPS PO Exam 2018. Institute of Banking Personnel Selection or IBPS is all set to organise the IBPS PO prelims examinations from October 13, 2018. The IBPS PO and MT prelims examinations will be held on October 14, 20 and 21 apart from October 13, 2108. IBPS PO preliminary examination consisting of objective tests for 100 marks will be conducted online. This test would be of one hour duration consisting of 3 Sections as English Language, Quantitative Aptitude and Reasoning Ability. The candidates shall be required to qualify in each test as per cut-off marks determined in each test. Each candidate will have to secure a minimum score on each of the tests as well as on the total to be considered to be shortlisted for Main Examination. Depending on the number of vacancies available for IBPS PO recruitment, cutoffs will be decided and candidates will be shortlisted for IBPS PO main examination. October 20 will be the third day of IBPS PO prelims 2018 examinations. IBPS or Institute of Banking Personnel Selection began on October 13, 2018 and will be concluded on October 21, 2018. IBPS PO prelims examination consists of objective tests for 100 marks will be conducted online. The IBPS PO prelims exam would be of one hour duration consisting of 3 Sections as English Language, Quantitative Aptitude and Reasoning Ability. IBPS PO and MT main examinations, the second stage of the recruitment, will be held on November 18, 2018. This will be followed by an interview process where candidates who perform well in the main examinations will be selected for that. In IBPS PO prelims exams, the candidates will be required to qualify in each test as per cut-off marks determined in each test and according to the PO notification, each candidate will have to secure a minimum score on each of the tests as well as on the total to be considered to be shortlisted for Main Examination. 1. The candidates need to note carefully their Roll Number, Date of Exam., Reporting Time and Venue for the examination given in the call letter. 2. The candidates should be present at the examination hall before the time given in the call letter. 3. The candidates arriving late for IBPS PO Prelims exams will not be permitted to enter the examination hall. 4. IBPS PO aspirants will have to bring call letter alongwith the photo identity proof in original and a photocopy. 5. The candidates need to write their roll number and registration number on the photocopy of photo identity proof. 6. The aspirants will be required to put their left thumb impression clearly and sign clearly in the respective spaces provided on their IBPS PO call letter in the presence of the invigilator in the examination hall. 7. The IBPS PO aspirants should hand over their IBPS PO admit card alongwith the photocopy of the photo identity proof duly stapled together to the invigilator in the examination hall, when they collect the call letters. 1. Any stationary item like textual material (printed or written), bits of papers, Geometry/Pencil Box, Plastic Pouch, Calculator, Scale, Writing Pad, Pen Drives, Log Table, Electronic Pen/Scanner, Any communication device like Mobile Phone, Bluetooth, Earphones, Microphone, Pager, Health Band etc. Other items like Goggles, Handbags, Hair-pin, Hair-band, Belt, Cap, Any watch/Wrist Watch, Camera, Any metallic item, Any eatable item opened or packed, water bottle, Any other item which could be used for unfair means for hiding communication devices like camera, blue tooth devices etc. 2. All ornaments like Ring, Earrings, Nose-pin, Chain/Necklace, Pendants, Badge, brooch etc. will be thoroughly checked. 1. The IBPS PO candidates should bring stationary such as pencils, eraser and a ball point pen with them to the examination hall. 2. The examinees may do their rough work on the sheet provided. After the test is over, the examinees should hand over the sheet, given for rough work to the invigilator before leaving the room. "Any candidate who does not return or is found to attempt to take or pass on the questions or answers inside or outside the examination hall will be disqualified and the IBPS may take further action against him/her as per the rules," according to IBPS notfication. The facility of Scribe / Reader would be allowed to Visually Impaired (VI), Orthopedically Challenged (OC) and candidates suffering from autism, intellectual disability, specific learning disability and mental illness who have disability of 40 % or more if so desired by the person, said a statement form IBPS. The facility of scribe is meant for only those candidates with disabilities who have physical limitation to write including that of speed. In all such cases where a scribe is used, the candidates must ensure that they are eligible to use the services of scribe as per Government of India guidelines governing the recruitment of Persons with Disabilities. The candidates will have to arrange the scribes at their own cost and according to IBPS, the scribe can be from any academic discipline. The IBPS PO online preliminary examination will be held on - 13.10.2018, 14.10.2018, 20.10.2018 and 21.10.2018. The result of the IBPS PO Prelims exam is expected to be declared in the month of October or November 2018. The download link for the IBPS PO exam 2018 admit card will be active till October 14, 2018. The candidates are advised to visit the IBPS website before the deadline ends to download the admit IBPS PO admit card. Follow the link from organisation website to download call letter. At login page, enter the Registration No / Roll No and Password / DOB(dd-mm-yy) at the required places to download the Call Letter. The candidates will be shortlisted based on their Prelims exam marks. The shortlisted candidates will then appear for the IBPS Mains examination.